Recycle Deposit – 24 hour drop sites | D&O Garbage Service, Inc.
D&O Garbage Service, Inc. Address: 1140 Boone Road SE, Salem, Oregon Phone: 503-363-7923 Hours: Open for Recycling seven days a week/24 Hrs. Accepted Items: Cardboard, Dry Cell Batteries, Glass, Magazines, Newspaper, Scrap Metal, Tin & Aluminum cans. Allied Waste of Marion County Address: 2215 N. Front Street, Woodburn, Oregon Phone: 503-981-1278 Hours: Open for Recycling Monday thru Friday 8am to 5pm. Accepted Items: Cardboard, Glass, Grayboard, Magazines, Mixed Scrap Paper, Newspaper, Office Paper, Plastic Bottles & Jugs, Tin & Aluminum cans. Marion Recycling Center, Inc. Address: 3680 Brooklake Road NE, Salem, Oregon Phone: 503-390-4000 Hours: Open for Recycling Monday thru Friday 7am to 3pm. Accepted Items: Cardboard, Glass, Grayboard, Magazines, Mixed Scrap Paper, Newspaper, Office Paper, Plastic Bottles & Jugs, Tin & Aluminum cans. Pacific Sanitation Service, Inc. Address: 3475 Blossom Drive NE, Salem, Oregon Phone: 503-393-1031 Hours: Open for Recycling seven days a week/24 Hrs. Accepted Items: Cardboard, Dry Cell Batteries, Glass, Grayboard, Latex Paint, Magazines, Mixed Scrap Paper, Motor Oil, Newspaper, Office Paper, Plastic Bottles & Jugs, Tin & Aluminum cans. Valley Recycling & Disposal, Inc. 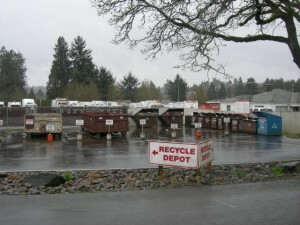 Address: 2515 Salem/Dallas Hwy NW, Salem, Oregon Phone: 503-585-4300 Hours: Open for Recycling seven days a week/24 Hrs. Accepted Items: Cardboard, Glass, Magazines, Motor Oil, Newspaper, Plastic Bottles & Jugs, Tin & Aluminum cans.